If you improve your eating habits this year by doing one thing, it should be eating healthier breakfasts. We all know the saying that “breakfast is the most important meal of the day,” and it certainly is the fuel that pushes us to get the day started. What you eat for breakfast can either make or break your day, so make sure to whip up a delicious breakfast to start your day on the right foot. We are used to just grabbing a sugary coffee on the run and skipping breakfast altogether. We get stuck in a smoothie rut or tend to just have a bowl of sweet cereal and call it a day. Today, we are here to help you discover new, healthier recipes that will keep you satisfied until lunch and motivate you by how delicious they taste. Eggs are packed with proteins and there are a variety of ways to prepare them. You can fry, poach or scramble them or turn them into an omelet. Use coconut oil instead of butter for cooking your eggs and get added benefits. 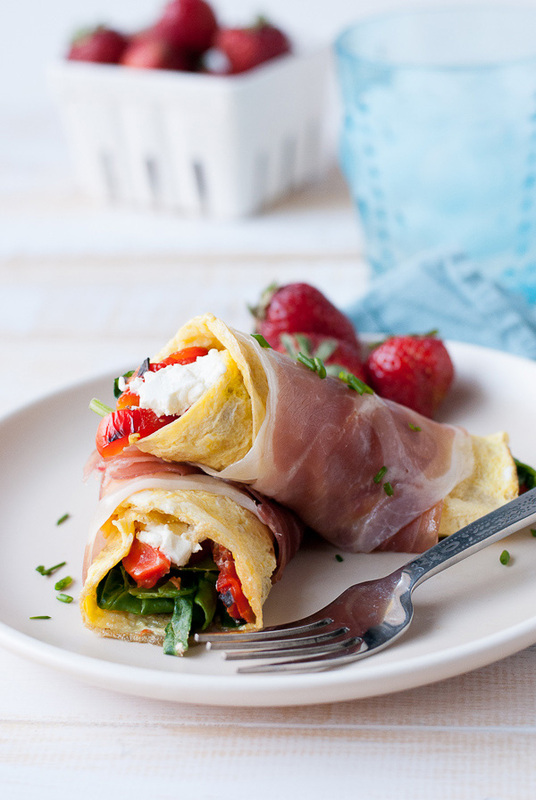 We’re loving these prosciutto wrapped omelets with spinach, roasted red pepper and goat cheese by blogger Pineapple & Coconut. Perfect for a weekend brunch with friends and family! Think of your usual whole grains for breakfast, and you have a base for those poached eggs. Do you usually make quinoa for dinner? Save the leftovers for breakfast, topping with fresh berries and honey for a sweet variation or with an egg and shredded cheese for a savory variation. When making pancakes or waffles, replace the all-purpose flour with whole grain flours such as quinoa flour, millet flour or even buckwheat flour. 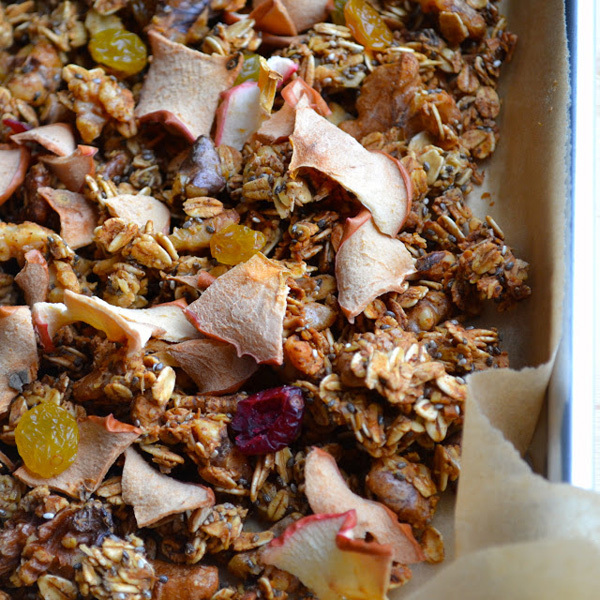 Granola is another great way to add whole grains to your diet, like this maple apple crunchy superfood granola on Taste Love and Nourish blog. Eaten with yogurt as a parfait, it’s a hearty and nutritious breakfast. One of last year’s biggest trend was juicing, and it is still going strong in 2014. Juicing, when done correctly, is a great way to get high amounts of nutrients and vitamins from raw vegetables and fruits. 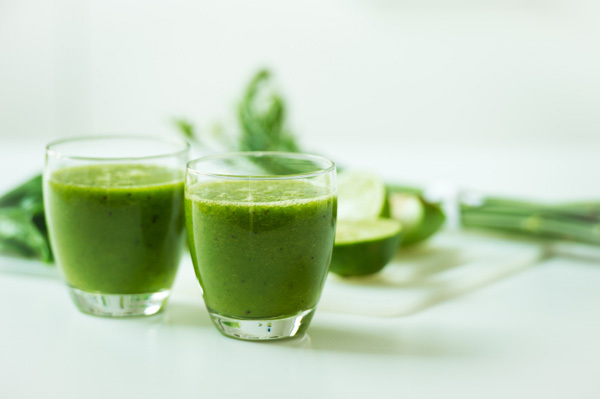 Juice drinks are also a way to boost immunity, like this creamy coconut kale smoothie, and are a perfect way to use leftover odds and ends in the refrigerator. Have a few leaves of kale, some overripe berries and a splash of almond milk? Make a quick smoothie that will satisfy you until lunch. Foods like chia seeds, goji berries, raw cacao and nut butters are great power foods that will increase the nutrition of your breakfast. Power foods are nutrient-dense, typically very filling, and add texture and flavor to your dishes. Drizzling an extra tablespoon of olive oil over your scrambled eggs is a simple way to get healthy fats into your first meal of the day. Look to different cultures of the world for inspiration. Instead of making the classic oatmeal with brown sugar, why not go the Asian route by cooking it in vegetable broth, splashing on soy sauce, sprinkling with sesame seeds and topping with a poached egg? 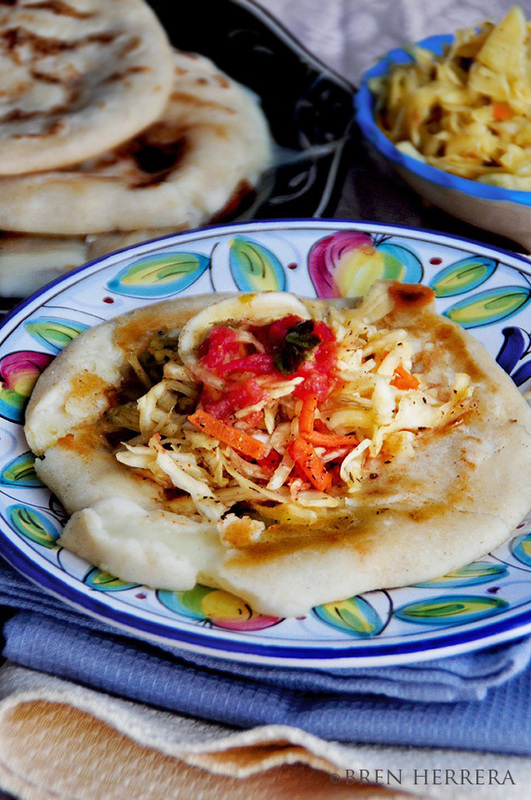 Try a classic Venezuelan breakfast, consisting of a corn-based arepa. Gluten-free, it can be topped with scrambled eggs and fresh vegetables. Pupusas are also a delicious breakfast item that don’t pack on the calories and are hearty enough to satisfy you until noon rolls by.